Estimated shipping times can be found on each product page. Please note that these are estimated shipping times and are subject to availability of products and/or the manufacturer’s availability. If a product you have ordered is out of stock or on backorder, we will contact you with a shipment date and you can decide to either keep the order, cancel the item(s) or cancel the entire order. On occasion, issues may arise that may lead to additional production time, such as the manufacturer experiencing a backup or delay in production. If this is the case, you will be notified as soon as we are made aware that a problem may exist. Please verify stock and availability prior to placing your order by contacting our customer service department at custserv@bibismv.com. All items that are in stock ship will arrive in approximately 5-7 business days from the ship date. Second day express deliveries only ship during standard business days and do not ship or deliver over weekends and holidays. There may be a cut-off time to accept orders. Second day delivery may not be available for items drop shipped from our suppliers and artisans. If you need to return an item that had free shipping, the refund issued will be for the item price less the standard shipping cost and restocking fee. Custom, furniture, bedding, personalized/monogrammed and special order items are not returnable or refundable. Many of our custom furnishings are made from natural wood. Due to the unique nature of this element, no two pieces of wood (even from the same tree) will look exactly alike. Each computer monitor displays color differently, and we cannot be responsible for variations between the actual product color and how it is displayed on your screen. 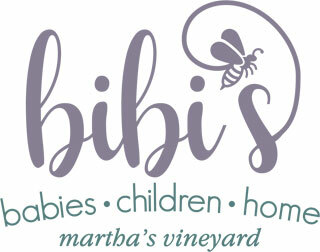 Descriptions of merchandise, including colors or shades, textures and other features are provided to us by the manufacturer; and Bibi’s-MV assumes no liability whatsoever for the description, for variance, including in colors or textures, minor imperfections and/or for a product not meeting with customer satisfaction. For most of our manufacturers, we offer fabric swatches and finish samples. You may contact custserv@bibismv.com to request a swatch or sample to help you make a decision on your order. Sample costs and shipping will apply. In the event of a disputed credit card charge, which is ultimately found to have been legitimate or which otherwise finds, in whole or in part, in favor of Bibi’s-MV, the customer shall be responsible for all attorney fees and costs borne by Bibi’s-MV. The terms of any purchase from or dispute with Bibi’s-MV shall be governed by Massachusetts law, and any litigation arising out of such dispute shall be brought in the State of Massachusetts, Dukes County. Most of our custom made furniture is made from wood, which is a natural living, breathing product. Nature never duplicates, and does not make two pieces of wood, even from the same tree, exactly alike. Because wood responds to variations in humidity levels (just like hardwood flooring), furniture can expand and contract over time depending on the climate. Please note that the degree of humidity or dryness in your home may cause splitting which will not affect the structural integrity of the piece and is not to be considered defective. Certain types of wood will have more visible knots and wood grain. Our artisans make every effort to conceal knots and grain on painted finishes, but due to natural resins within some wood types (i.e. pine), they cannot completely eliminate them or guarantee to control them. Knots and grain may bleed through and slightly discolor the finish, which may be more apparent on lighter color finishes. This discoloration is not to be considered a defect in craftsmanship. Irregularities in the finishes are not to be considered defects. While finishes are durable, they are not indestructible. Please contact us for care and maintenance of your wood furniture. We have swatches available for many of our lines that we are happy to loan out to customers. Please note that many of our artisans custom mix paint for their finishes so swatch samples may vary slightly from actual finishes. Bibi’s-MV does everything possible to ensure a smooth and prompt delivery of your furniture, light fixtures and mirrors. However, be aware that there are circumstances out of our control that may arise and result in a delay in the production or delivery of your items. We do our best to give accurate lead times for each furniture manufacturer but estimated lead times are not a guarantee of a specific delivery date. We welcome your inquiries as the estimated delivery time approaches and we can follow up to give you a more specific idea of your ship date at that time. Also note that shipping time for freight items (this includes furniture, large light fixtures, mirrors and some rugs) is approximately 10-15 business days from the time that the item(s) are picked from the manufacturer. We act as liaison to best assist you in delivery but there are variables that are out of our control as we are considered a third party. Generally deliveries occur Monday-Friday between the hours of 9:00 a.m. and 5:00 p.m. Freight companies will contact you directly prior to delivery to schedule delivery day and time frame that works for you. If you need to reschedule your delivery, please contact them as soon as possible so as not to incur any additional charges for missed delivery appointments. If your scheduled appointment is missed, you may be charged an additional delivery trip fee. Please do not arrange for items to be delivered when no one is home to receive them. Also, when the freight company contacts you to schedule a delivery appointment and you are unable to accept the delivery for a period of time, you are subject to storage fees that the freight company will charge for storing your item. Occasionally, due to high demand, some of our products may be backordered for a period of time. In the case of a backorder, you will be notified of the expected ship date of that item. All backorders will ship promptly when available. For standard freight delivery, our shippers deliver furniture to your driveway. Premium in-home delivery is available for most items if you would like the item placed inside the threshold of your home or in a particular room up to 2 flights of stairs with all packing materials discarded. Please refer to the product page to see what types of shipping is offered for that particular item. We do not offer assembly for any of our deliveries. If you ask the delivery company to assist you in assembling an item purchased from us, you are doing so at your own risk. Freight items can ONLY be shipped within the 48 contiguous states. If for any reason your custom furniture piece does not arrive with the specifications that you selected when ordering, Bibi’s-MV reserves the right to have the item(s) replaced and reshipped at no additional charge to you. You should contact us immediately if this occurs so that we can get the replacement in the works as soon as possible. Bibi’s-MV will be unable to assist you in the repair or replacement of damaged goods if the above procedures are not followed. Please remember that furniture items are not eligible for return. In the case that the ship to address is not accessible by regular delivery truck, the customer will be responsible for all additional delivery charges, i.e. ferry fees and remote access charges. Please contact us if there are any special delivery requirements that must be taken into consideration for the item to reach the final destination. Bibi’s MV upholds the warranty provided by the artisans and manufacturers who create the products. Because the details and duration of our manufacturers’ warrantees differ. Please contact customer service for specific warranty information on products of interest.